Arranging a full working can be, well, work. First, I do not 'follow' deities, I am not a 'follower' of my gods. I think that the image of Jesus as wandering teacher, and the church’s presentation of Christianity as a set of prescriptions for how to live, has over-emphasized ‘following’ as a religious model. But my Gods don't teach me how to live, or make rules. They aren't leading a movement of which I am a member. I do worship the Gods and Spirits. All of them, really. I use the term ‘worship’ to mean ‘ritual reflection of relationship’. I intend to build and keep my kinship and friendship with the spiritual world. 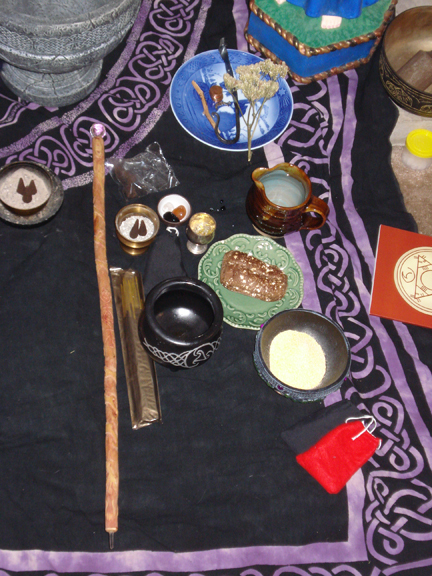 There are many facets to that project, and one of them is the formal politenesses of ritual. My own aesthetic is fairly High Church – I like good art employed consciously to bring spiritual forces closer to the mortal world. So I enjoy making Shrines and devotional corners in my home and life. So my spiritual practice takes me from the handicraft bench out to the woods and back to the meditation-seat at my shrine. When I’m being observant it can be rather a lot to do. So I refer to my religion/spirituality as my 'spiritual work', not as my 'faith’. I conceive spirituality as rooted in practice, not belief, and consider a ‘religion’ to be defined by its method more than by its doctrine. I commonly say that I 'work' a ritual (I like that better than 'perform'), and refer to the material props of ritual as 'tools'. To digress, I do not consider ‘worship’ (nor ‘work with’) to imply rank or hierarchy, nor expect it to be a one-way, bottom-up transaction. Worship operates precisely because human effort is worthy. We greet the gods as honored guests, give the kind of worthy gifts that mortals give. One core principle is that a gift calls for a gift, and each ought to give according to their nature. So the spirits, in turn, give us the gifts spirits can give – the blessings we seek in our work. In this we each – mortals and the gods and spirits - ‘work’ according to our nature, each for the good of the other. So to say that I ‘work with’ Brigid is simply to say that Brigid is included in (is a part of) my spiritual work. The form that part takes is or includes worship, and I’m willing to refer to the relationship as ‘devotional’, implying that I approach Her with love, not merely as a transaction. It says nothing about the relative status of me and Brigid. I do not count her as my ‘Lord’ in the sense of “-and-master”; she is a noble being, who inspires awe. Likewise it would be just silly to think of myself as her ‘equal’ – can I be the equal of a river or mountain? I make myself available to ‘work with’ her will, and I ask her aid in working my own will. So far that has all been good. So then, I find 'work with' to be a reasonable, neutral usage for describing polytheist practice, one that describes what really happens without any connotation of disrespect for the gods.